Our family loves music. I grew up around music my entire life. I did the whole 6 years of piano lessons thing, I was (and always will be) a band geek who played flute and piccolo (Go BA Pride), and also enjoy playing guitar. I loved having a piano in our home growing up and I have always wished for Luke and Abbey to grow up with that opportunity and music in their home as well. Music is a gift that you can literally use your entire life. My paternal grandparents are a perfect example of that. 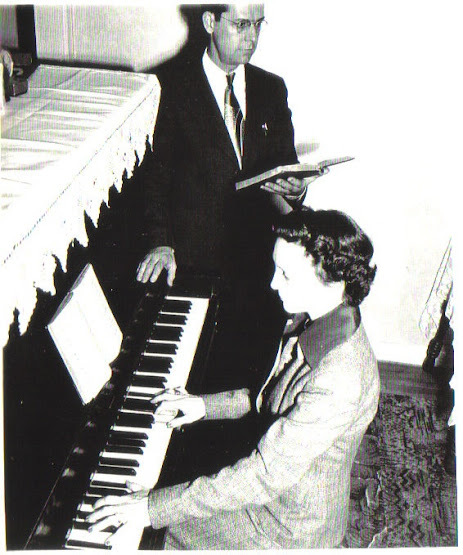 My dad's parents were musical evangelists. Music was a gift they they really did literally use their entire lives. My dad's mom played trumpet and piano and his dad played violin and mandolin. My grandfather was afflicted with Alzheimer's in his 80's. I recall visiting him in the assisted living facility in his old age. My siblings and I would bring our musical instruments (I brought my flute, my brothers brought their trumpets and my sister her french horn) and we played hymns for him. His face lit up with joy and he knew every song. Although his memory faded in so many ways and he didn't even recognize us, he could still pick up his mandolin and play songs from memory up until the day he passed away. Although when we are old we won't be able to do some things physically, like play certain sports, musical talent is something we will be able to carry with us no matter what our age. I want to make sure that Luke and Abbey are exposed to music so they have this opportunity to cherish it all of the days of their lives. Playing the piano has so many cognitive benefits as well. 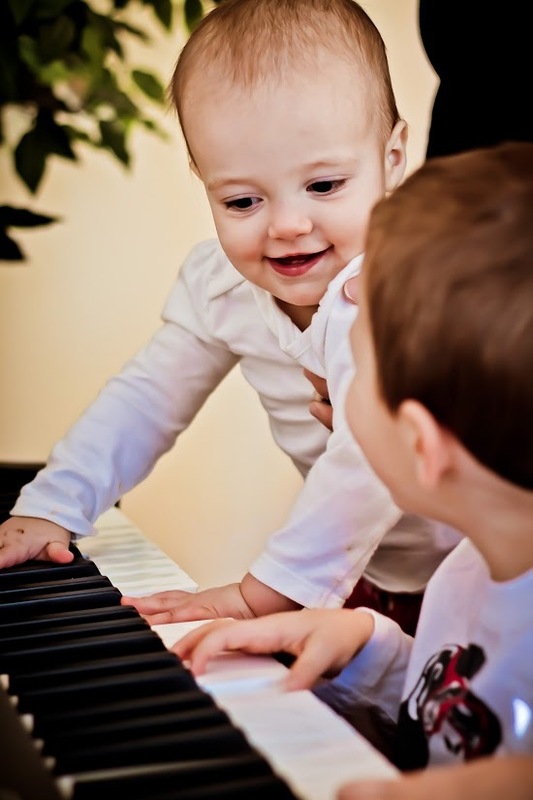 Pediatric researchers have found evidence that when a child begins learning to play the piano, or takes up any type of musical instrument, this stimulates certain areas of the brain that controls their fine motor skills, memory and speech. The mental exercises involved in playing the piano and hand-eye coordination tasks appear to help strengthen a child’s academic performance particularly in the areas of mathematics, science and reading. I strongly believe it assisted me in my academic success. Before Christmas when Drew and I were watching all of Amazon's lightning deals so that we could purchase Christmas presents, an amazing lightning deal popped up for a full-size electronic piano. After reading through the reviews and looking at comparable prices, we decided it was something we couldn't pass up since we knew we would be in the market for one eventually. So, now our family has a piano. We love it. Although it has been a long time since I have played, it is amazing how so much of your musical memory comes back. After sitting down and playing for over an hour, I realized that playing the piano is an excellent brain workout. Playing the piano is certainly not an easy task. Music notation written for the left hand (bass clef) is written entirely differently for the right hand (treble clef). 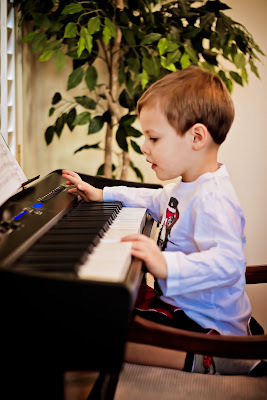 This requires some additional memorization and a great deal of concentration to develop not only the proper hand-to-eye coordination from staff paper to piano keyboard, but also the physical coordination to play two differently written lines of music in either hand at the same time. I could literally feel the results of my brain workout after sitting down to that piano to play for an hour. I decided that this was SO good for me right now. It is going to take a while though for me to be back up to the skill level that I used to be. Luke absolutely loves playing the piano. Our kids LOVE music and always have since birth. So, the piano is really a perfect addition to our family. Luke loves to sit at the piano, put it in demo mode (which automatically plays some pretty difficult and beautiful songs) and then pretend that he is playing them. He adds his own notes and so proudly says, "Look at me mommy!" Drew and I hope to be able to get our guitars out (we have an electric bass, and two acoustics) soon and play along with the piano (which can record as you play and playback, so we can play along with other instruments) and have some family jam sessions. We love that our church has a great resource on their worship website, www.austinstoneworship.com, that provides all of the lyrics, chords and even instructional videos on some of our favorite praise and worship tunes. Abbey loves the piano also.